Whose Lord’s Prayer? Whose Same Womb? Suzanne’s post gives us context to consider “wombly feelings, family loyalty” as understood by “the brother and sister” who are “of the “same womb, biologically related,” children and then adults who experience “the supreme relationship in ancient times.” In this post, I’d like to take this familial relationship (i.e., the relationship of being out of “the same womb” with another individual) as a lens for reading Greek Isaiah 63 and for reading the Greek gospel versions of the Lord’s Prayer. The Lord’s Prayer is a central prayer in Christianity also commonly known as the Our Father and in Latin as the Pater Noster. In the New Testament, it appears in two forms: …. Someone at anytime can “correct” the wikipedia entry, and yet let’s look at what it is today in English. The first language explicitly mentioned is “Latin.” Implicitly the important language, for sure, is English, which is what readers are reading and the writers were writing; and we English readers have to scroll down a significant way to see the Greek of Matthew’s gospel only, where we’re offered again the Latin with an audio link to hear only the Latin, followed quickly by the English translations. Their prayerful appeals are to a God who is more than a father Abraham and more than a father Israel than the named patriarchs could be. This is the kind of Person who is profoundly and viscerally aroused, as with motherly instincts, for them. When the earliest Jewish readers of the Greek gospels of Matthew and of Luke read the Lord’s prayer there, then there’s possibly not only an echo of the Greek Isaiah (I mean look at all the language referring to coming down from Heaven and to the Name of G-d in the Greek prayers in Greek Isaiah and in the two Greek gospels). There’s also possible in the Greek gospel versions of “πατὴρ ἡμῶν,” the idea of the wombly feelings of sisters and brothers of the same mother. Jesus is instructing the people in Israel, his sisters and his brothers that they may pray to “our Parent,” and this one in Heaven is profoundly aroused with motherly instincts. 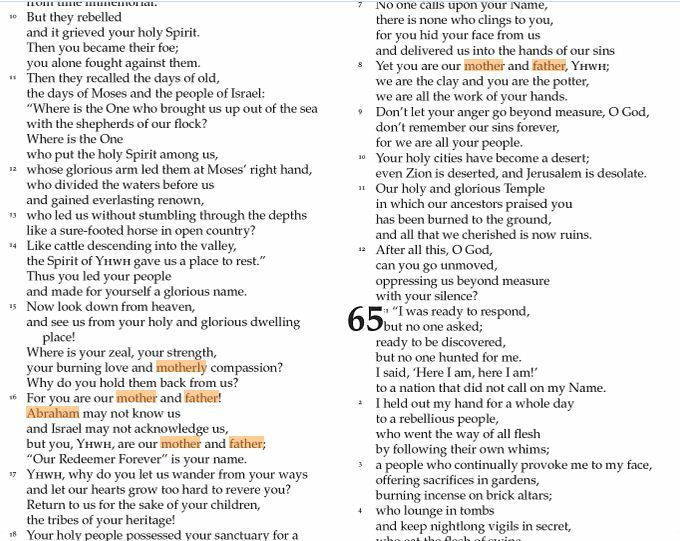 This morning, I want to include here in comments both Greek Isaiah 63:15-16 and the start of “the Lord’s prayer” in Greek Matthew 6:9b-10 and Greek Luke 11:2b. Then I’ll offer my own English translation of this Hebraic Hellene poetry. What is the point of this dribble? Jesus said “Our Father which art in heaven” and not “Our Mother which art in heaven”, so go argue with him hippie. Seriously, “but what if someone’s father is abusive”…what if someone’s mother is abusive? What if both their parents are abusive? What do you hippies propose changing the text to then? Obviously the prayer is based on healthy family relationships, of the sort that Jesus’ teaching should engender (but that Paul’s teaching destroys). I guess we can always change the prayer to “Our Democrat President which art in heaven” to satisfy you abortionist homosexual hippies. When you start your rhetorical line of questioning, with “Seriously,” then I’m not at all sure who you’re really asking. Since your comment after my other post on The Rhetoric of NA28© is rather banal (i.e., “the Textus Receptus [is] … free”), hope you won’t mind my just responding to your comment here. Seriously, james, since you bring up “Our Father which art in heaven” (derived from the Textus Receptus, wasn’t it), then should you be too disturbed with how Anne Lamott reads it? Lamott has had one of her protagonists in one of her novels call him Howard; one of her friends in one of her autobiographies has, she writes, done the same. And then she’s used this biblical name in her most recent book of prayer. What I was hoping would be less distracting to you, and other readers of my post, is how the Greek gospels have Jesus modeling a prayer that seems derived from the Greek translation of the Hebrew Isaiah. So we have to go beyond the Textus Receptus to the Septuagint texts and beyond that to what looks like the Masoretic Text. Before hippies of any variety could “propose changing the text” in any way, I hoped you’d see, the texts were already changing. Before that, it would seem, Isaiah in Hebrew accuses God of having a רַחַם.